AAdvantage members can earn quadruple miles of 250 base + 750 bonus (1,000 miles per stay) between February 1 – March 31, 2018. This is a decent offer for those cheap one night stays where members don’t collect Choice Privileges points and they are member of AAdvantage program and find their miles still worthwhile. 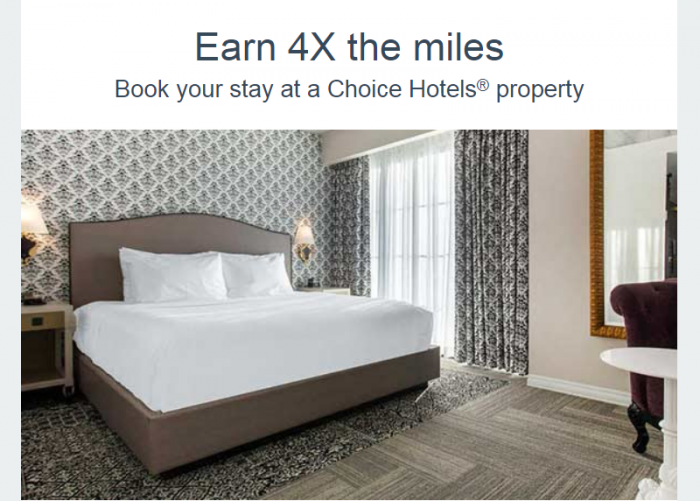 4X Miles Offer: American Airlines AAdvantage members must book their stay at an eligible Choice Hotels property. Hotel stays booked under certain rates are not eligible. Reservations made via third-party online retailers or wholesalers are also not eligible for this promotion. Promotion not valid for stays in hotel properties located in Denmark, Estonia, Finland, Iceland, Latvia, Lithuania, Norway and Sweden and not valid to residents of countries where the Choice Privileges program is not available. Offer is limited to four times the standard AAdvantage Miles or a maximum of 1,000 miles per qualifying stay. Standard mileage award is 250 miles per qualifying stay. A “qualifying stay” is defined as any number of consecutive nights at one hotel, regardless of check-ins or check-outs. Members must provide their AAdvantage Number upon check-in to be eligible or have selected AAdvantage as their earning preference within their Choice Privileges profile before their stay. Hotel guest name must match the AAdvantage member’s name. Promotion applies to qualifying stays with arrival between February 1st, 2018 – March 31st, 2018. Allow 6-8 weeks for AAdvantage Miles to be credited to your American Airlines AAdvantage Account. For Choice Privileges program details, eligible rates, eligible countries and information on earning AAdvantage Miles, visit www.choiceprivileges.com or www.choicehotels.ca/en/choice-privileges for details.